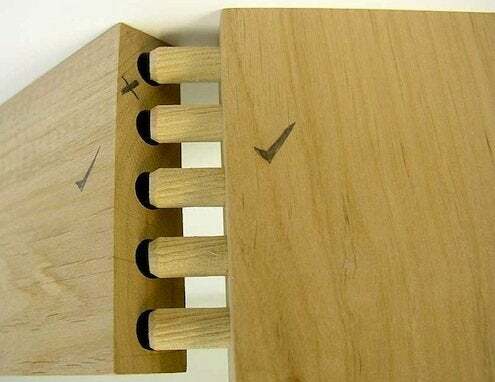 Here’s a technique professional carpenters use to conceal screws in fine woodworking projects: use wooden plugs. Use a dowel bit on your drill driver or drill press to make enough short plugs for your project. Pre-drill the holes for your screws with the same size bit, so you can drive the heads well below the surface. Put a little carpenter’s glue in the hole and gently tap a plug in with a hammer. Let the glue dry and saw the plug off flush with the surface using a pull saw, also known as a japanese back saw. These are super-sharp and as easy to work with as a kitchen knife; if you don’t already have one, a pull saw’s a great addition to any toolbox. You can also shear the plug off with a chisel. Sand the surface smooth and apply your finish. This technique also works great on cellular PVC material for exterior trim projects. Some manufacturers even provide the plugs and special pvc glue, so once you’ve countersunk the screws, it’s easy to make them disappear!